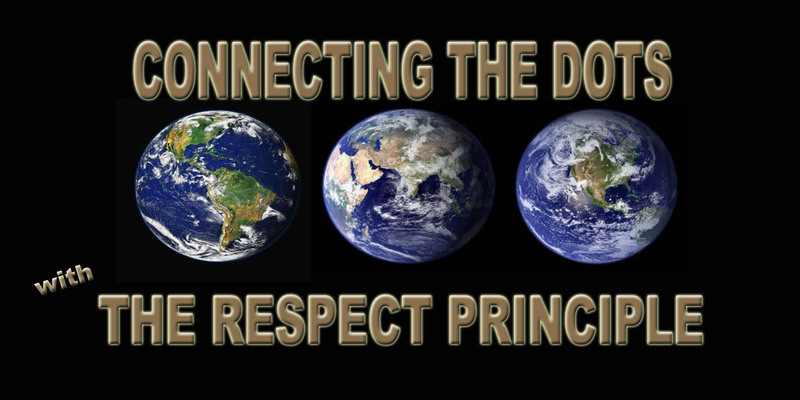 That is what Connecting the Dots … with The RESPECT PRINCIPLE is all about … getting YOU the RESPECT YOU deserve in your life! Thanks for all of your views. I appreciate every one of them as I climb this mountain. The current Canadian television advertisements airing promote “preventative” health care by showing and telling us we either take the best care of ourselves through out our lives or spend the last ten years of our lives in health care facilities, where “care” is, in reality for many people, limited, often neglectful and sometimes abusive. The irony is that government, health care and the business sectors do not really want us to be healthy because they still desire, even if just at a subconscious level, their income to be generated by “taking care” of people and their preventable problems … because they have not yet been able to imagine what truly reformed, preventative health care looks like nor the new income-generating opportunities such a fresh perspective will generate. Instead, observation, research and experience reveals the many ways the current job of “taking care” of people is actually detrimental and harmful, revealing the low RESPECT LEVEL we have for people … especially for our seniors. Globally, there are nations who study, evaluate and then rate countries on how people are treated. The highest rankings go to countries with the best childcare, meaning food, shelter, health care, and education. But, what about the care of the citizens who have, all their lives, contributed to their nation’s well-being, whether through their families they create through birth or adoption … the human resources they have provided to their country, government and businesses for their economic growth through the labor their children have provided, the taxes their children eventually pay, and then later, their own families, plus other contributions their children make during their lifetime? Why are a nation’s people who have given so much to their country just by living in their country treated as they are once they become dependent seniors? Why do we lock them away in homes, where, whether government or privately run long-term care home management see the bottom line first, instead of the people who have given so much to a family, community and nation? Once upon a time, in southern Ontario in the 1930’s, lived a farm boy whose parents worked the land for other farmers rather than their own. Money was tight. Food had to come first so there was no money for frivolous things like a bicycle for the boy, even though the neighboring farm boys had them. Not letting the lack of a bicycle keep him from joining his friends for an afternoon swim in the creek a few concessions from home, he ran beside his friends as they bicycled to the creek and back. The hard labor of farm work and running, plus a body predisposed to constant motion, joy in his physicality, plus his exceptional hand and eye coordination created a natural athlete … one who should have been a pro, but there were two things lacking: A rural, blue-collar mindset that did not acknowledge and even discouraged such inconceivable dreams, even after his athletic prowess was further demonstrated by his performance on the arena floor as one of the Wallaceburg Red Devil’s key lacrosse players, plus the lack of confidence developed by the limiting mindset of his youth. What was most important then was getting a “real” job, marrying a Catholic girl and having children. The problem is when we do not recognize, nurture and support people’s natural gifts, talents and abilities … the human resource they are and the best way to utilize their natural resources, we set in motion for our children and youth, a life destined to be unhealthy, launching a series of unhealthy habits that contribute to and finally result in health issues that could have been prevented. Soon enough, problems arose in his life. Taught to disregard his own dreams, his own self, he learned to do the same to others. To deal with his pain, he found ways to numb his feelings, to distract his thoughts, which made him more absent to his family and also to his own real needs. In his prime, there he was, famous in a small town, but unprepared for the fame due to his limited conditioning distraction filled the space where confidence should have been. It was too late: the damage had been done. Without a strong core of belief in his value as a person, an individual with his unique gifts, talents and abilities from early in his childhood, he was never satisfied: never filled in the way he needed most. He real and most important need, self-individualization was neglected so he learned by what he experienced to neglect himself and to pass on what he had learned. Preventative health care was not even considered, especially back then. If it were, the chemicals and pesticides being produced, marketed and used for food growth would not have been used. If it were, the feed for animals that were destined to become food for human consumption would not be tainted with harmful chemicals and pesticides. If it were, the tobacco industry would not have marketed cigarettes as essential to a happy life. If it were, our government would not have been making money from the consumption of alcohol at the health cost of its people. If it were, the medical world would not have sold themselves as the one and only answer and would have heeded their vow “to do no harm first.” If it were, the pharmaceutical companies would not have developed partnerships with the medical world just to sell product, no matter what the side effects. If it were, what was learned by psychological studies, whether from Freud or Jung’s theories, would have made a preventative difference by not just focusing on what was wrong with people … but what’s right … how to nurture and develop strong individuals, families, schools, communities, and a health care system that supported and nurtured an individual’s preventative health care by not putting money ahead of the human resources that generate the money valued more than the people who help make wealth possible. Now, he resides in a “nursing home” or what is now called a “long-term care facility,” which in itself says it all … long-term facility. He cannot believe he is where he is. He wants to go home. He does not know that now the government is sending the message to take better care of ourselves so we do not end up in a “long-term care facility” for ten years. He does not know the government is laying blame on him for not taking better care of himself. He trusted the people and community who raised him. He believed they knew best for him. He trusted the government’s diet recommendations. He trusted the chemical and pharmaceutical companies were not trying to hurt him to just make money. He trusted he could just drink some alcohol and not get addicted. He trusted he made enough friends along the way that he would not be lonely at the end of his life. He trusted his wife, the second one, would stand beside him, no matter what, that she herself would not get ill and not be able to take care of him. He trusted one day he would win the lottery so he would have the money to fulfill the unfulfilled dreams. He trusted his union would pay the insurance benefit he was entitled to so he could get the care he needs. He trusted that his family would be there for him so he could get the care he needs, but alas, he has taught what he was taught. Fit in. Do not rock the boat. Cope however you can. Do not worry about the consequences. Spend your money on distractions to mask what you are feeling or hoard it because you believe that is what will save you. For sure, the money will buy the creature comforts not found in the “long-term facilities” for the masses: the places where people go who need reactionary care and do not have the money or human resources to stay at home or to move into a “home” that actually meets all your needs. Preventative health care is necessary, not just for our government fiscal policy, but for the most effective utilization of our nation’s resources … people. However, rolling out “preventative health care campaigns” to individuals will not work if we do not change the underlying Disrespect Philosophy because only then will everyone get on board the “preventative health care” chain and truly make it really work. In the meantime, we, the government and all the businesses who reap from what has been previously sown, must also do their part to ensure those who, for whatever reason, were not capable of “preventative health care” for themselves and those they shaped, are well taken care of during their last years. Not doing so will demonstrate we do not really mean we value our human resources as much as we, or they say they do. Not doing so will also demonstrate a stagnate RESPECT LEVEL for our contribution to the low quality of life for our seniors. Shaming people for not taking better care of their selves comes from the same mindset that makes people feel less than their true value. Focusing solely on the bottom line, treating people like parts in a factory, comes from the same mindset. Creating profit just for the sake of creating profit comes from the same mindset … the Disrespect Philosophy that drives most of our world. Connecting the Dots … with The RESPECT PRINCIPLE requires us to shift our perspective, not only in how we think about our most valuable resource, people, but how to break out of the limited mindset to discover and develop new ways to generate wealth, plus life time good choices and good health … together, not at the cost of the other.